It just goes to show how much things have changed: two or three years ago I wouldn't have batted an eye lid at the state of this bus. It was quite common for buses to run in previous operators livery, and even if in some version of Barbie livery, previous colours visible through the paint work and damaged and odd coloured panels were not unusual - in fact for the double deck fleet especially such poor presentation was the norm. Today this turned up on the 86. Clear signs of previous incarnations of Badgerline livery can be seen around the lower deck windows. Typically for a photo taken at Derriford the passenger in the red jacket was too quick for me to get the whole bus in shot and I didn't get chance for a second attempt. Had she not been there you would have noticed the one smart section of bus. The rear engine cover has been repainted! presumably damage repair. As I mentioned above, these days such a mess is rare for FDC, in Plymouth at least. Even the older double deckers are looking very smart in full Barbie livery. Plymouth Citybus has always had a very smart appearance, these days FDC can generally match them. I can only assume that this bus was placed into service in a hurry and will soon reappear in full Barbie livery looking very smart indeed! Sorry your Father has not been too good of late and hope he is comfortable this morning. Dont forget that down in Cornwall there are still A and B reg Olympians running around - some of which have had repaints fairly recently. I am fairly sure that these buses will be repainted shortly - and I guess will end up down in Cornwall - most of them are down there already. To be fair to First Somerset & Avon (where the Olympians came from) they were working their way through the batch repainting them. Presumably by the time 34969 was due to go in, the decision to transfer it had been made. Graham, I've found FDC and Citybus use totally different methods when it comes to thier fleets. Instead of fixing body damage as it happens (Citybus), FDC lets it get worse and worse, then resprays the whole bus after only a few years. for example.. The Tamar link Dart was looking really dodgy recently, despite only being done just about three years ago! Spotted it from the front a few days ago, and it's been totally resprayed and looking very, very pink! I wasnt sure what state they were in at Somerset. 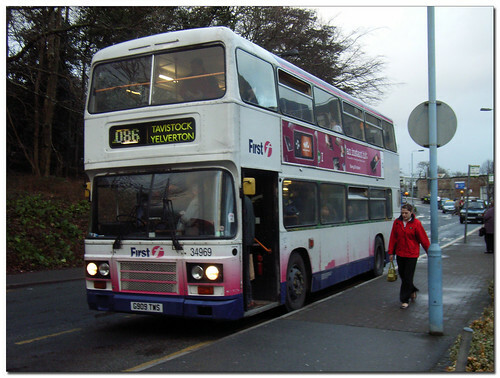 FDC have started working on the bus so I am sure it is being readied for a repaint. Was on this bus today and the interior is just as hideous as the exterior.